Tag Size: 1 3/4" High x 4 3/4" Long and 1/8" DOUBLE Thickness Microsurfaced Acrylic, Color on BOTH Sides. Price includes your text or wording on BACK side, up to 7 lines. Maximum Engraving: 7 Lines with up to 45 characters. DOUBLE SIDED KEY TAG - Includes Your Custom Text/Wording on the Back. 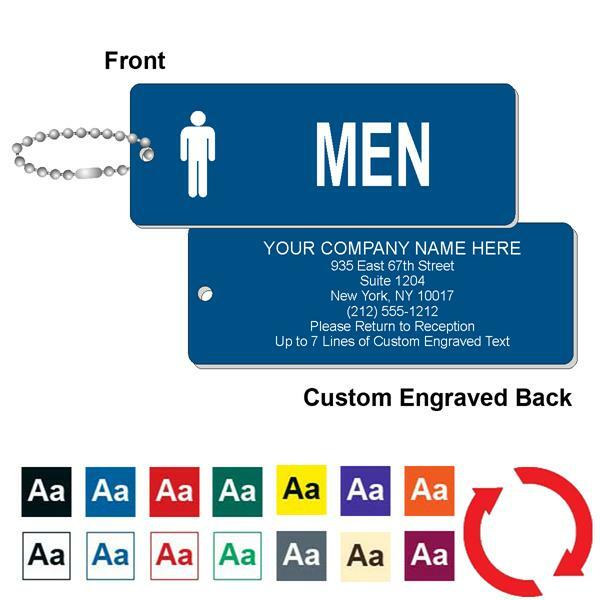 Our Mens' Restroom Engraved Key Tags are made in the USA of indestructible 1/8” thick ABS plastic with a durable Acrylic Cap (top color). The cap color is .010” thick and will not wear off. These tags have a high mechanical and impact strength, which means they will not break when dropped. Perfect size, sturdy plastic key tag for your mens room keys - Use in situations where the keys are always returned. Engraved on BOTH SIDES. Your Custom Message on the Back. Available in 14 colors- Standard is Blue with White letters. Allow 3-5 Business Days for engraving. TAG SIZE: 1 3/4" Tall x 4 3/4" Wide and 1/8" Thick. Maximum: 7 Lines with up to 45 Characters per line. Max. 45 Characters per line..